Appliances are to homes what apps are to mobile devices. They are the hears and souls the beautiful edifices need to actually function. The kitchen needs appliances like cookers, freezers, blenders and the likes to perform its duties effectively. Home owners usually endeavor to purchase top quality equipment for their homes, but even these top quality appliances are not built to last forever despite what the adverts may say. Faults and breakdowns are not necessarily the end of your appliances. In fact it only happens in few cases when faulty devices have to be packed up as unfixable. It is not unimaginable the most often the difference between an appliance that works after repair and one that doesn’t respond to repair efforts depends on who is repairing it. DR Appliances has come to make that said difference for Gilbert home owners. Our appliance repair service is one with a difference. We have not just perfected the art of doing so, but we I’ve also decided to do it with the highest level of professionalism possible. We also know that time is of the essence to our customers and as such, one of the major driving points behind out service is the speed of delivery. We do not allow ourselves to get held back by excuses such as unavailability of parts hold us back. We replace defective parts when necessary with authentic ones verified by the appliance makers themselves. 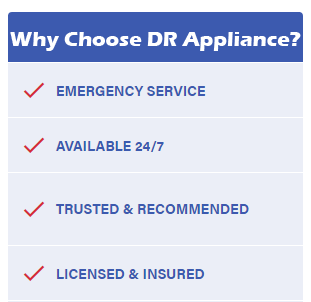 We know that there many companies who offer kind of services we also do, but they don’t all have the DR Appliances edge. What is this edge? You may ask. Well, appliance repair is our life and once we are contacted with customers' repair needs, from start to finish, we will treat you to the best service you have ever received. It’s not so much of what we do, but how we do it that sets us apart. While others may view appliance breakdowns as just another problem in the home, we see it as an emergency – because in all truth, that is what it usually is to the owners. A faulty air conditioner in hot winter months example, is just an emergency waiting to happen. Health complications can occur from such a seemingly minor home appliance problem, health complications that will in turn lead to more expenses than planned. Our technicians and work men and women are both very qualified and at the same time highly experienced. We have assembled a team that has practically seen it all, from a dishwasher that is clogged by the kids to an air conditioned that only blows hot air; noisy refrigerators, cookers that are not burning well enough – the list is endless (literally), but we never accept defeat. Our technicians know that the right service and the right parts will almost always fix the problem, the only exception happening in the case of improper usage. Another reason to patronize us has to be information that we will give. Most of the time, appliances go bad because of bad or improper usage. We do not like to see our customers spend so much money on avoidable repairs. So we will help them break appliance usage “myths” (that have no scientific of any other backing) in order to help maximize the lifetime of their appliances. We give expert refrigerator repairs to suit the needs of our customers. French door freezers, bottom freezer, top freezer, compact refrigerators and any other kind of refrigerator. Whatever brand it may be, whichever fault or may sport, we have it covered. Gas refills, part replacements, circuit issues resolution and so much more. If it is broken or appears to be, we are the go-to people. We will also offer consultation services for cases when owners do not know or are not sure of what exactly is wrong with their refrigerators. We don’t offer refrigerator repairs that go bad again in little or no time – our work will always have lasting results and we are prepared to guarantee it. When an AC unit goes bad or functions improperly, the problem is usually not easy to decipher. Conventional repairers even go as far as approaching things from a trial and error angle – we don't. Our game plan is always to look for what part of the AC is bad and tackle it head-on. Whatever part of the AC requires repair, whichever type it may be – window units, split units, etc. And whatever brand of AC it is, we will repair it in as little time as possible. Washers and dish washers make life considerably easier, we often don’t realize this fact until they break down. For fast and hassle free repair, contact us as soon as you discover the fault. When dryer vents get blocked, they either don’t work well enough or they stop working totally. To prevent an unnecessary blue day, let us unblock your dryer vent today. We will also take care of every other dryer fault in record time. However it may be required in Gilbert, DR Appliances will handle all appliance repairs however it may be. We offer onsite checks and repairs, and when the case requires, we take the faulty equipment to our offices and have them looked at in more detail. By choosing us to repair your appliance, you are not just signing up for world class repair services, but are signing up for the best of it there is.